I saw this recipe featured on the Food Buzz Top 9 last week and said "yes." Partially because my friends and I have been taking turns tormenting each other with links to recipes for fall desserts featuring apple and pumpkin. I don't make a lot of cakes, but this one was easy (using pie filling and mixing in the pan). It's a perfect fall gift for your friends. 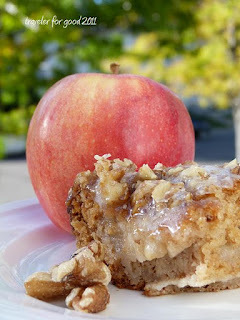 Click here for the recipe on The Country Cook. Brandie, the author of the blog, had her friend Becky from Baking and Cooking, a Tale of Two Loves write as a guest blogger. It's always good manners to bring a treat when you're a guest, and this recipe is definitely a treat. We've been enjoying beautiful fall weather here in Colorado, so I took my slice of cake right outside to take a photo then dive right in. Yesterday (after baking the apple cake) I went to visit a friend who has tiny feet. After hosting us for pizza and movie, she sent me home with a bag of shoes. This morning another friend met me at the door of the church with a box of kids shoes. It tied in nicely with the sermon today about our responsibility to all the children of the world....not just the ones that we know. 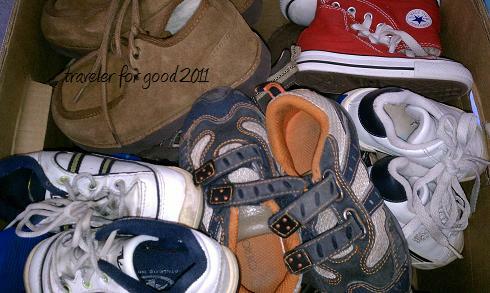 All of these shoes are being donated to Soles 4 Souls as a part of the Flippin' Good Deeds Challenge. Thank you so very much for collecting those shoes. We really appreciate your efforts ( and your friends for donating!) Thank your for changing the lives of the children around the world. Thanks Rebecca! We're having a good time with the shoe drive. Tonight we were spelling words out of donated shoes in the living room while hiding from the snow...pictures to come. I'm sorry that my comment was so late. I just saw your comment. I was busy with my son's wedding, which was Oct.22nd. Looks like your apple cake was wonderful, too. It's a great recipe to have on hand, and goes together quickly. I'm glad that you like the cake, and thank you for trying it out. Thanks Becky! I think I'll have to make it again before the fall is over.